What India taught Me About Healing Blog Series- #1 – Dr Alexina Mehta, N.D.
My first memories of India were of me eating bread with jam at the age of 2 and being passed around to various overly enthusiastic and animated relatives. As an adult, family members encouraged me to go back and visit India and see the country from which our family originates. For years I knew when I went to India, it was going to have to be every bone in my body saying “YES” to it. I knew the feeling would be a deep inner knowing, an excitement and a yearning to finally go and see the vast ocean of wisdom, chaos and culture that I knew as India. About a year ago, I felt the call from the motherland coming to me more strongly. My draw to her was becoming more pronounced as I began to notice my thoughts going there. Dreaming about the colors, the people, the wisdom. I also began to feel my Indian-“ness”…and for me, this felt like a very ancient part of me, which would be activated when I would read quotes from various spiritual teachers from India, and when I would move into deep meditation. Again, a deep longing to connect to the sacred teachings was becoming stronger. I knew my journey to India would be a sacred one, and I simply accepted that I would be presented with the perfect opportunity at the perfect time. Well, the time came. 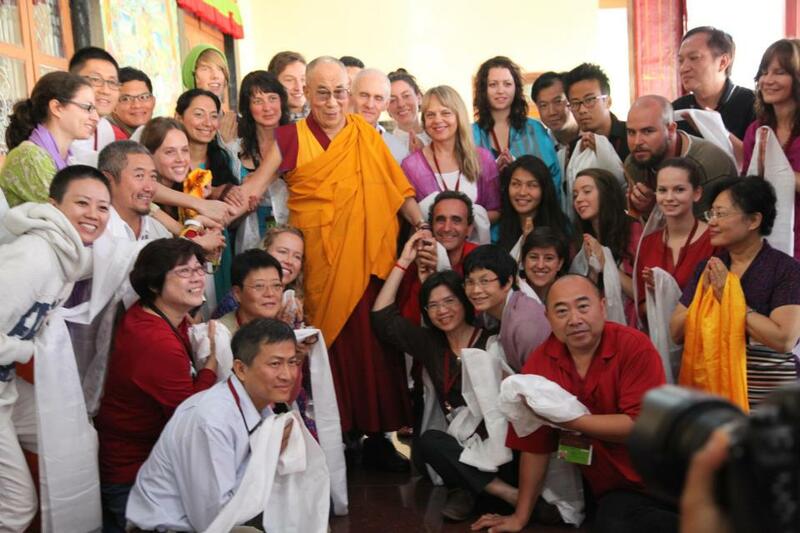 A dear friend was organizing a trip, and mentioned that the focus was to receive teachings from His Holiness, the 14th Dalai Lama. The topic of the teachings was “How To Attain Enlightenment in one lifetime.” I knew that was a tall order, and I knew by saying yes was going to initiate some profound teachings. Cleansing the soul on every level, and leaving behind that which radiated “enlightenment” was what I realized I wanted at the deepest level of my being. For me, enlightenment is a state of personal freedom. I was up for the opportunity, and grateful it came into my life. I was also going to to connect to my spiritual roots and honor my family. An interesting part of my family history is that my great grandfather was the mapmaker on an expedition team that discovered ancient artifacts including the oldest written text found on earth, The Diamond Sutras. A couple years ago, I became more attuned to these teachings, and began to awaken internally the parts of myself that remembered what this was all about. It was a very cool feeling, to all of a sudden have an aspect of myself awaken that seemed to be dormant before. I trust in the perfect timing of things, and this was one of those. So…the time came to go to India. It was a long journey, but that was irrelevant. I knew I was going to retrieve more of myself there, and I was excited to feel India’s energy and my connection with her. The minute we arrived I was amused by the airport in Goa. Indian writing on the walls, and my favorite, people’s head bobbed like no other. It was pure comedy to see the amount of relaxation in the necks and heads of these people. When we got outside of the airport, I felt an instant recognition with the land. Inside myself I heard “Welcome home.” A sigh of relief and and a trusting in the flow of India’s teachings that would be evident as the days unfolded. 1. There is a perfect timing of things. Trust in the process. When you do, you will feel infinitely supported in being exactly who you are. 2. Know Thyself. I knew for me going to India would be a trip that would fulfill my heart’s ultimate desire. I did not squeeze in extra visits to other places because of the need to “do more.” I went knowing that I would get exactly what I needed. 3. Honor the ancestors. My father is very good at this one. He constantly remembers and gives thanks to those who have come before him in the family, recognizing that he would not be where he is without all of their efforts and support. Life is a web and the gifts that are passed down are miracles. When we begin to celebrate the miracles in life (and they are everywhere) and see it as the incredible experience it is, more magic ensues. One day at the teachings in India with His Holiness, I took great note of a comment he made about how fortunate and lucky one is to have a body. Enough said. I would love to hear your comments or similar experiences/insights below. Please share this blog to anyone who you feel would benefit. Thank you for reading and until next time!